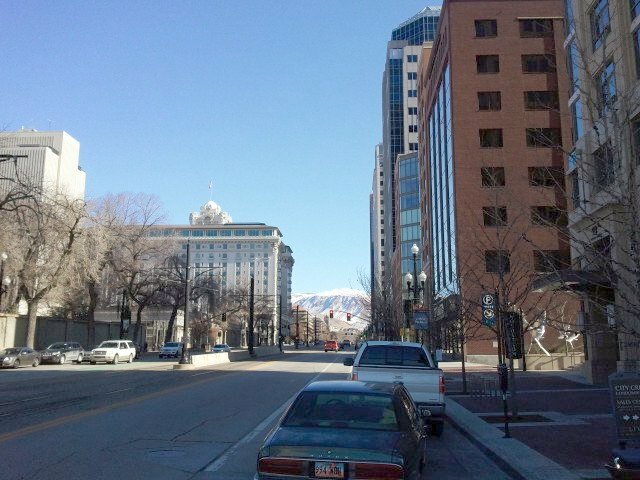 Over 4200 attendees at a geneatech conference in Salt Lake City, Utah. Just that sentence alone is enough to inspire ooooooooo's and ahhhhhhhh's from genealogy professionals and non-professionals. Getting that many like-minded people under one roof has to generate some energy, right? It did (and it created some serious heat as well). 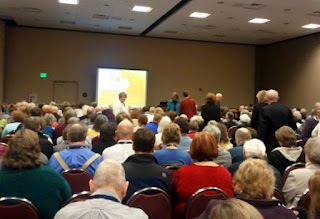 I think for the most part attendees enjoyed the experience of RootsTech.Sessions were full, exhibit hall was full, lots of action all three days. Logistics-wise everything seemed to run smoothly and on time which is very nice. Overall I enjoyed the conference but can't help but being a little disappointed in some areas. Maybe there was too much hype going into the conference? Or maybe I was just on too many cold meds to be in my usual frame of mind that "all" things genealogy are cool! Here is my run down of my overall impressions. 4200+ attendees for a genealogy related event...they hit it outta the park! 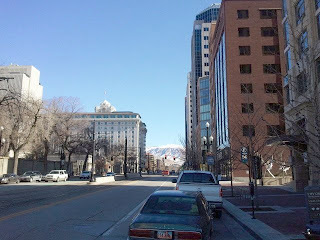 Salt Lake City, UT! Such a beautiful, beautiful place. It's a "little" big city. Family History Library within walking distance of hotel. Making new friends...after they asked "what are the beads for?" Opportunity to talk one-on-one with experts in their related ﬁelds. Educational opportunity in sessions as well as out. Vendors answering questions and showing new tricks about their product. It doesn't get any better than hands on training. New product launches, competition is good for everyone and the energy new products generate is exciting. Presentations....a void of advanced level sessions, big void. Vendor hall...where was all the tech? Where we're the gadgets? I saw software, more software and oh look more software. In my list of hits, meeting and catching up with the other Geneabloggers was, without a doubt, the highlight of the conference. Some of these people are very busy and have some amazing things going on! I feel inspired, awed and intimidated by them all at the same time! As far as the misses go the biggest for me was the vendor hall. I know what you are thinking, I'm too close to that because of my job but hear me out this isn't about how they exhibited its about who exhibited or who didn't! 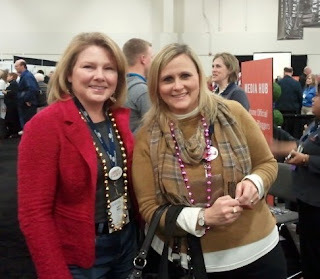 This was RootsTECH, so where was the tech in the vendor hall? There was software, subscription database services/online trees and a couple of apps (one very cool app by the way called About One). That hardly covers technology. Call me silly but I fully expected to walk into the exhibit hall and see tablet computers, phones demonstrating genealogy apps, cameras with GPS for photographing at cemeteries, and a bunch of other cool stuff that I've never heard or thought of. I didn't see any of that. Maybe that will catch on in future years? If you haven't attended RootsTech and you have an opportunity to attend next year I think you should. There is value to be found in most genealogy conferences, some more than others. Also every person that attends has different objectives for being there. What may not be a successful conference for me may be very successful for someone else. Try it and see if it is a hit for you. Thanks for the post, Jenna! I'm not sure if I missed anything by not being able to go. I did download the syllabus and glanced through it. I agree that there didn't seem to be many "advanced" level sessions. And 4,000+ people, that's a lot of people! 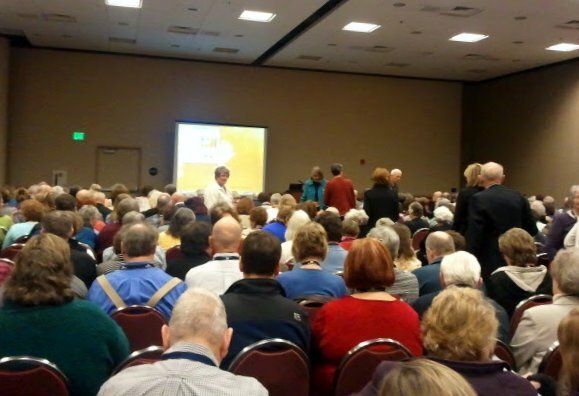 I would have been disappointed, too, about not seeing more "tech" in "RootsTech." Tell me more about About One...what did you like about it? About One is for organizing your personal, family life. Although I am sure there are many ways you can use it. It was designed to help families be organized and connected together. You can share information and calendars with each other. The idea was from a mother who's child was in the hospital from a serious medical event and the doctors needed to know what medication the child was on, what shots they had, what allergies they had, blood type etc etc. The mother was so frantic (understandably) that she couldn't answer any of those questions. She came up with About One so she could have all that information with her (mobile app) or access to it by logging on from any computer. About One will sync with your Google or Outlook calendars. It sounds like a very, very powerful tool and I'm just touching on the basics. That does sound very interesting! Thanks for letting us know about it! Well said! I loved the meet-ups, missed the gadgets, and was disappointed not to find more presentations above User Intermediate. But, all told, RT was a great experience. So glad to finally meet my KC-"cousin".